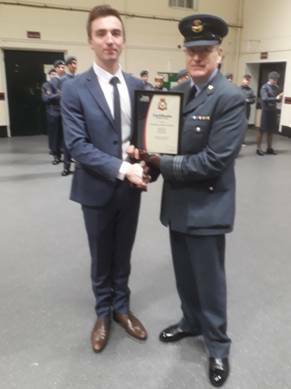 Mr Connor Andrews of Newquay, a Civilian Instructor with No 730 (City of Truro) Squadron Air Training Corps has received a Certificate of Meritorious Service from Commandant Air Cadets, Air Commodore Dawn McCafferty. The award was made at the Annual Formal Inspection of 730 Squadron by Wing Commander Francis Reis. Connor joined the Air Cadets in 2012 and rose through the ranks to Cadet Warrant Officer. During his time as a cadet, he lead the Squadron Team to victory in the Annual Caiels Trophy event on 4 occasions. He was Lord Lieutenant’s Cadet and RAF St Mawgan Station Commander’s Cadet. He also undertook a gliding scholarship and is a holder of the Duke of Edinburgh’s Gold Award. Now a civilian instructor, Connor is embarking on his quest to become an officer in the Royal Air Force. Wing Commander Reis said: ‘To receive a Commandant’s Commendation for cadet service reflects the dedication and commitment that Connor has shown; the award is well deserved.